Have an old phone lying around, and wish to buy a brand new iPhone 5S? Maxis has just announced a new trade in & trade up program, allowing you to trade in your iPhone 4/4S, Samsung Galaxy S3 or Note 2, and purchase an iPhone 5S at a discounted price, or even for free when you sign up for the most expensive postpaid plan from the telco. 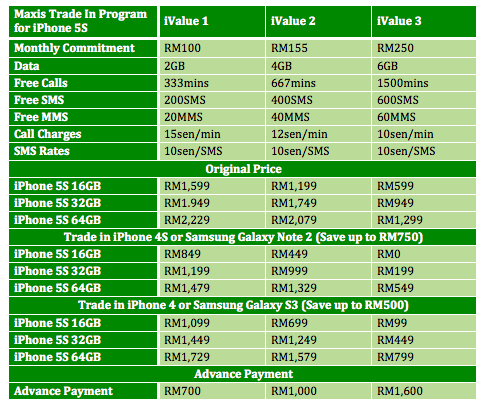 According to the prices above, if you trade in your iPhone 4S or Samsung Galaxy Note 2, you will save up to RM750 (except for iValue 3 whereby you save only RM599). As for the iPhone 4 or Samsung Galaxy S3, you will save RM500, meaning that your 2 years old smartphone is worth a mere RM500. If you are a new Maxis customer or have been with Maxis for less than a year, you will have to pay an advance payment as listed on the table above. Visit Maxis now for more information about the trade in program.